Know someone who wants Thicker, Fuller hair? 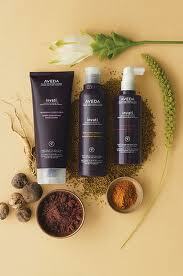 Aveda recently launched its newest hair care line Invati. Aveda's Ivanti is formulated with revitalizing Densiplex that helps energize hair growth. The take home Invati Exfoliating Shampoo, Thickening Conditioner and Scalp Revitalizer Spray are 97% Naturally Derived. The Exfoliating Shampoo removes build-up that can clog pores and renews the scalp with wintergreen-derived salicylic acid. The Thickening Conditioner restores strength and improves hair elasticity, reducing breakage, with arginie derived from sugar beets and soy protein. The Ivanti Scalp Revitalizer was created with turmeric and ginseng, that helps energize and rehabilitate the scalp around the follicles when massaged in. See what others have to say about the Invati System by visiting Invati Testimonials. We invite you to stop by any of our three Aveda Salons today to experience Invati Hair Care. A few words from our Educational Director, Wade Williams, on why he loves the Art of Hair and the Points of Difference that Felix Andrew Aveda Salons offer. Schedule your experience with one of our stylists today at one of our three Aveda Salon locations in Naples, Estero or Bonita Springs, Florida. Aveda recently introduced the Smooth Infusion Texture Smoother. The Texture Smoother is a salon product that will smooth natural texture and reduce drying/styling time. Ultimately, giving the guest maximum versatility. Aveda's Texture Smoother is a healthier demi-permanent alternative to the traditional smoothing treatments. The product contains gentle, naturally derived ingredients-unlike other straightening treatments- and is proven to leave hair in improved condition. After the treatment, the hair is smooth, frizz-free and infused with shine for up to two months-even in high humidity. Call any of our Aveda Salon locations to schedule your visit!